Home was on our minds today. We did a service for a police station and Simeon did a good job speaking about God's love. Then we were off to get an authentic Honduran breakfast. We said our goodbyes to the Sumners at the airport. I truly appreciate their ministry in Honduras. I've witnessed them show Christ's love to hundreds while being here. Wherever they went, whether it be honking the horn to everyone they pass walking on the road or saying hello to the soldiers, the policemen, they showed compassion. Lessons were learned from their lives. They are wonderful people and I treasure the memories. It felt good to come back to America; I thank God for His protection and blessing. We shall see what else God has in store in the years to come. God bless! Thursday there was no rush in the morning. I slept in till around 7. It was great. The afternoon entailed some games of corn hole and an airplane ride. It was my first time riding in a four passenger airplane. Bro. Alan took us up and showed us the valley which they lived in. The ride was exhilarating seeing the mountains for miles and the farm life of the green valley. Riding to service that night, I asked Bro. Alan on tips of being a missionary. He said to make sure you keep giving your all to the Lord, continue to put yourself in the altar and let Him lead you, wherever that may be. It just might be something you never dreamed of before. In the church's office, before going out into the sanctuary, I thought about how I have grown to love their church. The older women have been so welcoming, even in our lack of understanding each other's language. The children all have been so unashamed to be loving, running up to give you hugs or to teach you some of their hand games. The teenagers there have a love for God and were so sweet to me. I wiped my tears, not from being tired this time, and went on in to say hola to everyone. Each one of us testified and you could see a theme. Keep your focus on Jesus, He is worth it. God is so cool in how He has different people speak on the same thing. After testifying, us ladies sang 'Way Maker.' The Holy Spirit came by so strongly. It was like a wave of God's presence and I wouldn't want to trade it for anything. What seemed to be only a half an hour, the church worshipped for about an hour. God is so good! On the bus, we said our last goodbyes at each spot as the kids jumped off the bus. One girl in front of me asked me to stand up to give her a hug. As the bus was moving she didn't want to let go. Later, I found out, years earlier that her mom said right in front of her that she did not love or want her. You have no idea who you are going to impact, the people that need your love. God does and He leads and orchestrates our lives to affect others for His glory. Wednesday we went to two police places and a military base. They were my favorite ones from when we did services last week. It was neat sharing the same experience with the other half of the Sent team of seeing hundreds of military personnel enthusiastically doing the actions to Father Abraham. For lunch we went to Denny's. You know how some restaurants sing if it's your birthday? Well, this Denny's they have someone to dance with you and spin you around while they sing. It was interesting to watch how they made a production of it. Another memory was when Rhoda offered me to try some of her BBQ sauce. When I replied yes, Bro. Alan confidently said, "Joyanna, you're going to be a missionary." I'm guessing it's because I was willing to try just about anything, even when he said if I wanted to ride outside on the back of the car, fireman style, like one would often see here. When he saw that I was enthusiastic about trying, he quickly withdrew the offer, never expecting me to be willing to do it. We had great services at each of the places, especially the military base. At the police academy, while Amber was testifying, my eyes decided that was the best time to be a running faucet. Unfortunately, this is what they do when I am tired and I have not found a remedy for it yet. While trying to get my eyes to stop watering, the other girls looked at me questionably and I would give them a big smile and mouth that I was not crying. I hope the huge crowd of police cadets that we were sitting in front of on the platform do not think I was not being a overly emotional lady. Oh well, if they do, they do, can't change it now. The military base is one of my favorites. They are so exuberant. I felt God's presence strongly and I pray that God will continue to keep our brothers in Christ there. After the services, we were off to the meat street vendor. It's one of Bro. Pahlman's favorite places to eat here in Honduras, and it is easily understood why. I got a beef shish-kabob and boy was it tasty. They also give you tortillas and other fillers to eat. We put our carry out containers on the hood of our SUV's and started to dig in underneath the stars. While having difficulties pulling off a piece from the skewer, one went flying in the air, had hit Bro. Jellison and landed on the ground. Yes, I was sad at this, that meat was delicious. Seeing a beautiful husky by us, I got its attention, thinking it to be a stray dog. It came over and gobbled up the goodness. Telling the dog how fortunate he was I looked up and saw the man next to us smiling. I reckon he found me talking to the dog amusing. When he called the dog over, it dawned on me it was his dog all along. He let us feed it some more, (not my shish-kabob of course) and I got myself a new friend, Blaska was its name. The man was friendly. He let out his other dog and two little girls out of the car and we said hello or rather hola, to them. On the way home I knocked out, making the long drive home seem like 15 minutes. On Sunday mornings they run two buses, one regular and a short bus. I decided to ride the short one for the first time. The short one picked up more of the ones who lived in town rather than in the country. A variety of ages came, grandparents, moms and dads, teenagers and children. When entering the church, the little girl who fell asleep on my shoulder the night before, gave me a bear hug, grabbed my hand and led me to where she was sitting. She did not want to let go of my hand until the time to clap came. The song service consisted of kid's songs, some of which are real convicting. One is about how Jonah is swallowed by a big fish and how if you disobey God, bad things may happen. Another one is how the turtle didn't go to church because he was sleepy and how some Christians are like that too. Us ladies taught the children's Sunday School. The theme was Gideon and overcoming fear. The little boy who was picked to be Gideon was a riot. When it was said that Gideon was scared, he started to shake and looked frightened. I was impressed. They gave him a broom stick to use and when it came time to break the false idols into pieces, who was kids wrapped in tin foil, he reared the stick back. Elizabeth Sumner stopped him, gave him the eye, and told him gently. The little tyke did a great job of barely touching the other kids and knocking them down. The children had a blast seeing Amber, Anna and I, the ugly Mideonites, (yes, it is fun doing the ugly faces to fit this) all 'die' very dramatically. I got to use my chicken puppet again and I thank God for helping me. My voice was pretty much gone and when doing the puppet show, my hoarseness went right along to sound like a chicken, (ha, I had a horse voice and sounded like a chicken) and was loud enough to be heard in the sanctuary. After saying goodbyes, I went back in the short bus. When walking up the steps I saw it was not Bro. Scott driving, but a man who attended their church replaced him. I got a little into the bus when I realized that I did not see any of the Sent team on there either. It then dawned on me, this bus was probably not going back to the Sumner's house. So I promptly said adios and jumped off. I made a good decision because I found out the bus was not going back to the Sumner's for the afternoon and I would be staying at one of the church member's house for the afternoon. On the way to church that night we rode with Sissy, Elizabeth Sumner, and there was an accident on the road. Stopped on the gravel road, we were going to wait till they had it moved so we could fit through. One of the young men had a different kind of thinking and waved us on to try to fit through. Sissy adamantly shook her head no. The man just confidently kept on waving her on. She inched through the wrecked truck and the side of the road, barely making it without going off the side. We were dumbstruck when we found out the bus had gotten through it behind us. The last night of the Kid's Crusade ended on a high note, literally. The kids screamed as they watched Timothy smash a pie in my face, the consequences of being a team captain and losing. I didn't mind, for I made a request that there be peanut putter mixed in with the whipped cream. Peanut butter makes everything better. One of the memory verse games had us laughing. They lined up the kids with balloons, each one having a part of the verse. After saying the scripture, one by one, Sissy would pop a balloon. The kids would cower if she came near their balloon and with a mischievous smile she would take out the balloon. The last girl was terrified of having her balloon popped and she kept whipping it away before Sissy could poke it. Finally she just throws the balloon up and runs away. The skit ended with one of the main characters turning back, right before the celestial city and then the other one making it. The altar service on the girl's side entailed the teenager girls praying for the younger ones and then afterwards standing with their hands raised to God. I admired their hearts that wanted to serve their Creator. The older women also came up to pray with the girls and then, as the teenagers, had their hands raised unto God. It was a beautiful time. Today was my favorite day thus far. It started with an absolutely beautiful morning with the sun breaking through the haze in the valley. From the patio, the scene of Prince, their white horse grazing in the tall grass and the large herd of neighbor's cows lumbering afar off gave a peaceful air to the morning. Had a great time at the soup kitchen: playing with the kids, teaching a boy how to do a number on the electric guitar and trying yucca. After serving, we all stopped to eat. They gave us the choice to eat with a fork or to eat it with our God given forks, our fingers. Seeing most of the Hondurans eat it without silverware, I wanted to take a stab at it. After washing my hands I sat down to a bowl that had the yucca, which looked like small skinny peeled potatoes, cabbage salad drizzled with a red sauce and pork rines on top. It was really good, messy, but good. The Saturday Sunday School lessons were a joy to do. We did the story of Joseph with the message of forgiveness. At one place, there was a group of men gathered outside the chain fence bordering the patio that we were performing and listening intently. Having Americans dressed up in Bible costumes doing a play outside someone's house is probably not an everyday occurrence. I like how they have microphones and speakers wherever the Sumner's go, for not only are you ministering to the congregations, big or small, but you are ministering to those who stop and listen surrounding the place. At the last stop, the kids were in a small garage like building located in the suburbs on a mountain. There was no way we could put on the skit in there. So everyone turned their chairs the other way and we did the play in the road. Luckily for us, the road was not heavily traveled on. The only traffic we had was a man with two donkeys carrying wood. The sound system was in the middle of the road with Anna and Rhoda at the back edge of the road. While narrating, our four legged friends did very nicely walking over the cords and not bumping the speakers. The man gave us an apologetic smile and continued on his way. Towards the end of the skit, Bro. Pahlman's part of being the kind got real interesting. Watching the rest of the skit from the back of the car with its hood up, I witnessed Bro. Pahlman ride up on a smaller bicycle with his ball cap on backwards. All of us did not expect it and started laughing. After telling Joseph, who was Simeon, Bro. Pahlman (the king), he didn't have to go back to prison, he whipped, "Yeah, I'll even give ya a ride!" So with Simeon trying to jump on the back of the bicycle as they were exiting, the scene ended and the bike was put back where the kids had left it. That night I was playing the part of a princess, formal dress included, (thanks be to God for having me make a formal, medieval looking dress years ago, never knew I was going to use it for this). I'm not going to lie, it was a lot of fun to act that part. Some of the girls liked it when I curtsied before them and they would curtsy back. The night's message was choosing Christ over the lies of the enemy. There was a good response in the altar service. God is so good! On the bus ride back home, I sat next to a little girl who stole a piece of my heart. After a while she leaned on my shoulder and I laid my head on top of hers. She fell asleep. I kept awake as the kids behind me liked to mess with my hair, which I didn't care because one, I was too tired to care, two, I was on the way back home (home is whatever home base God has me to be at the moment) so no need to be fancy and three, teasing has no language barriers so, better to take advantage of it. It is so fascinating to see these kids be so open and loving, they are not afraid to come up to you and give you a hug. They made it so easy to minister to, and without knowing it, they ministered to us because they were just following one of the greatest commandments, and that is to love. This week has gone by in a fast moving, hazy blur of many memories. Monday held memories of going to the Valley of the Angels, where we shopped for souvenirs. The journey took us on a road where you look down and see the car riding on the edge of the mountain. We stopped and took photos. My, the view was absolutely gorgeous. It was picturesque with the view of the green patchwork quilt, simple farmhouses sprinkled across it. Pine tree covered mountains loomed in the distance. Everything was in a gentle, bluish haze. The town was filled with colorful shops. I was impressed with their talent of beautiful paintings, carved wooden boxes and hand-made pottery. At first my mind went into overload with everything and was a bit tense, but after a coffee and sitting down to enjoy a scrumptious meal, I felt more at ease. The meal's name I don't know, it was something like a tortilla mixed with chicken and cheese and boy was it good. I had a passion fruit drink and when receiving the glass I remarked that you knew the juice is fresh when you see the fruit on the outside of the glass. Unbeknownst to me, that "fruit" that was sticking to my glass was actually a piece of pickled onion. Oh how they teased me for making that mistake. I tried the coconut dessert where they freeze a concoction into a small cup. A popsicle had been placed inside, making it easier to eat when you pop it out. Making things interesting, I poured some of the passion fruit juice into the small cup and dipped the coconut popsicle into it. I do not regret this decision. The store workers were friendly. One spoke English and it was enjoyable having a small conversation. A woman in one of the stores wood burned whatever you liked into your purchased merchandise for free. Coming back to the store to buy a knife that I had to think about, I found out that she had engraved all our names onto wooden key chains. It was her tradition they said to do for the Sent teams. She was very nice, she even charged me less than the ticketed prices. On the way back home, we stopped once more on the side of the road and got some pictures. There was a tree a little ways from the road down the mountain that had no leaves, but walnut looking fruit. We had a good times throwing rocks at it, seeing if we could knock the dead fruit off. It was a good day. There was some interesting sights incorporated throughout it, a porch roof that was a top of a school bus, driving through a herd of cattle and a couple of horses and even a man herding another group with a bicycle. You never know what gems you might witness outside your window, but the greatest treasure was the ones I was sitting next to. We had a wonderful time, teasing one another, swapping stories and sharing experiences. Friday we went to a police station and conducted a service there with the whole team. The man in charge was a Christian. It is amazing to see God's hand over the institutions here when they are Christians. After doing a bit of shopping, we were off to set up the church for the kid's crusade. In correlation of the medieval theme, we had white and turquoise curtains lining the wall, "torches" around the building, cardboard knights guarding the doors and in the front, the entry of a castle. The castle was my favorite, with it being about 8 feet tall and 10 feet long, complete with an operational grate door made out of duct tape. The bus ministry here is absolutely wonderful and so many come to church by this mode of transportation. We had the opportunity to ride along and it was so cool how even though we may not speak the same language we still make so many connections with the kids. Some knew how to play tic tac toe, so my notebook is lined with the old games. Some taught me the Spanish words to animals. I would make the noise and they would inform me of its name. Unfortunately, I have the memory of a gold fish... (Maybe I should ask what that name is) and had to keep asking what they were called. Some of the girls were good teachers, and went slow so I could understand them and had patience when I pronounced it wrong. That night was show time. The kids loved seeing us dressed up in our costumes. We performed the skit similar to Pilgrim's Progress. There were quite a lot of people there, mostly kids, but there were teenagers and adults as well. I pray that the message of having their burdens rolled away will have the saved rejoicing and the sinner convicted. I have never been waved at with a machete until now. Entering one of the military bases, a line of me were walking with machetes and when exiting the base, the reason why was seen. They were "mowing" the grass by hacking away at it. Looking around, you could see the bottom halves of the trees and the rocks lining the driveway, painted white. I found out this was their form of landscaping to make things look nice. Most bases would have these and other places as well. Rhoda and I have this little opening joke when addressing the crowds. I would say, "Hola," and then she would say, "Hello." We would get a few chuckles and then we would continue as normal with me speaking English and her interpreting for me. I thank God for His faithfulness at each place we went. I do believe every time it was asked of the men and women “who acknowledges their need of a Savior?” hands were raised. God is so good! The men had the opportunity to go to a prison. The ladies took a wonderful 2 hour nap in the air conditioned car. We felt pretty safe for there was a guard watching out for us. The view from the dirt parking lot was spectacular with the mountains surrounding us. It was great coming back to “home base” again after all the traveling. God bless the Sumners! I just did the traveling for one week and I was worn out and to think they do this every other week. Hours of driving and early mornings are very tiring! God, please put a sapphire for all the police academies and an emerald for all the military bases they go to in the Sumner’s crowns! The south team was able to sleep in--leaving at 6 o'clock. We headed to the police headquarters of the squads, the Special Forces where there was well over a hundred police officers. They were very kind. After we sang, we stood off to the side. Across the other side of the open air bleachers, I witnessed a head police officer directing two men to come down with him. As they walked down the sidewalk to one of the buildings, I had a suspicion of what their mission was about. My suspicion was confirmed when each of them returned carrying a chair. They brought them to us and directed for us to sit. I thought this to be a very kind gesture and was quite impressed. This also happened at the other places where we went. The next stop, another open air service, was surrounded by mountains. I was in awe of how the Creator of these majestic mountains and the vast blue sky was right there in our midst. He has been so faithful in each of the services. We then went to pick up Bro. Pahlman from the airport. While waiting for him to arrive, the men had their shoes shined. The worker pointed at my feet and mischievously smiled. He said that I should get my shoes shined. I was wearing sandals. The police academy that we went to next was pretty big. While waiting in the car, we observed the brightly colored buildings and the cadets running (literally) around. When we went up to the platform where there were chairs awaiting us facing the crowd, more groups came, and more... and more...about 250 training police officers in all. I was feeling more nervous than usual. Things loosened up when they started to sing “Father Abraham”. Two hundred and fifty men and a few women in uniform, all shaking their heads and turning in circles was an amusing sight indeed! Well, the few glimpses I saw for I myself was turning in circles. I think the military base had them beat at singing “Father Abraham”. At least 300 military people were singing and doing the actions for it. Oh, how we had fun! Not only did we have fun at these services, but I thank God for what He did in them. At every service there were hands raised when asked about the condition of their soul and they acknowledged their need of a Savior. It is a good thing to know that our God is still a saving God and who still knocks on the doors of men and women. To God be the glory! 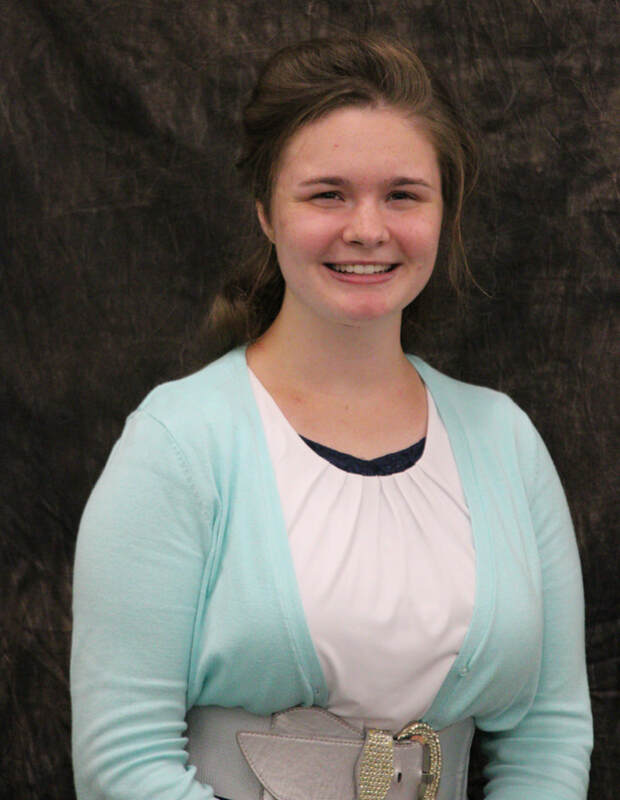 Joyanna Kies is a Junior at Free Gospel Bible Institute.